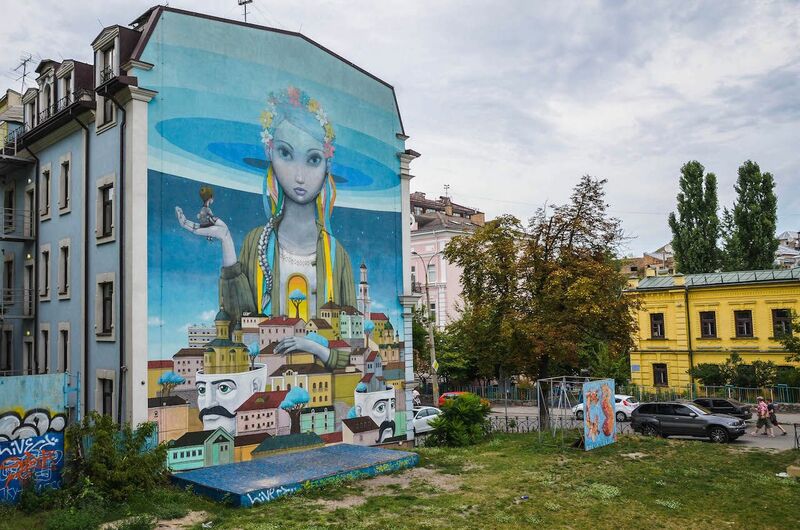 Kiev’s fame as an Eastern European cultural hotspot has increased dramatically since 2014 when a number of large murals began appearing on the facades of old Soviet buildings. Today, Ukraine‘s capital city hosts over 150 pieces of public art produced by local and international artists, often hidden in lesser-known parts of the city. The bold, massive paintings in the neighborhoods east and west of the Dnieper are reshaping the city’s identity. 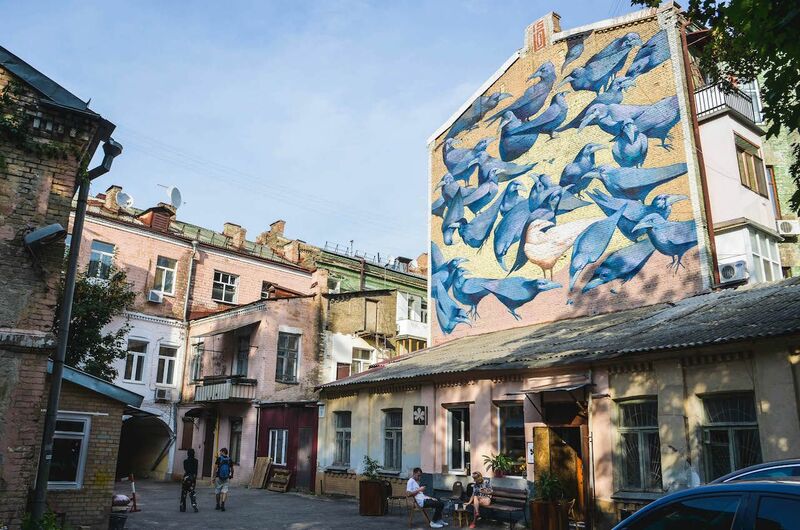 Kiev, a millennia-old metropolis with a long history of conflict, is quickly becoming a vibrant hub for creatives by establishing itself as a central node on the global street art scene. 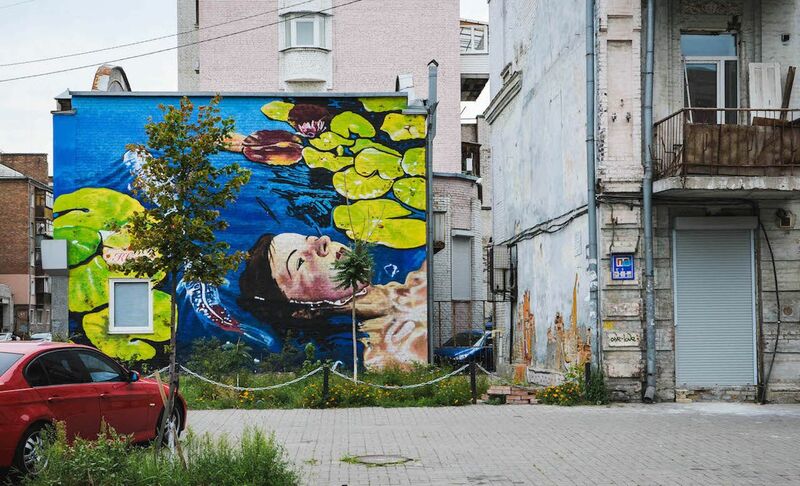 Exploring Kiev through its murals is a highly rewarding treasure hunt, and by going out in search of the colorful compositions that decorate the urban landscape, you will also find yourself discovering historical landmarks, amazing architectural pieces, and underrated areas you would otherwise never visit. Note that “Kiev” is the Russian-language name of the city, whereas “Kyiv” is the Ukrainian-language name. Here we use the traditional and most commonly used spelling. London-based Ukrainian artist Anastasia Belous painted this striking mural as part of the ArtUnitedUs project in 2016. The image is located steps away from the Tarasa Shevchenka metro station and the Museum of Modern Art of Ukraine in the Podil district. It shows a woman floating in a pond with her head above water, surrounded by water lilies and koi carps. Although the artist used bright, vibrant colors, the picture conveys a sense of calm in the midst of the busy city streets. 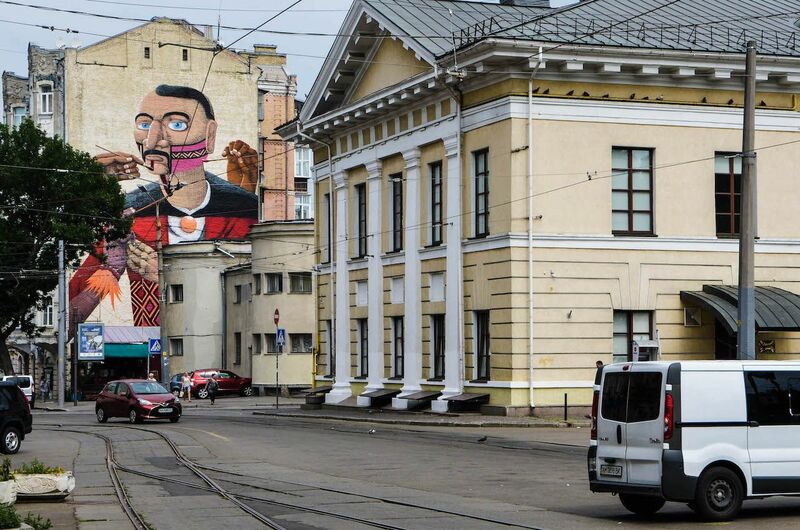 You will just need to walk a few steps from the Kontraktova Ploshchad metro station to see this mural by Brazilian street artist Francisco Rodrigues da Silva, AKA Nunca, peeking out over the busy streets of Podil. In an attempt to unite Brazilian and Ukrainian cultures, Nunca painted a 50-foot-high Cossack man as he is being adorned with traditional Brazilian painting. The creation of this mural sparked a controversy among the residents of the neighborhood, who opposed the painting of the image to protect the century-old building’s historical relevance. This giant mural covering the wall of a five-story building near St. Andrews Church and the Bulgakov Museum represent the rebirth of Ukraine after the 2014 revolution. Painted by French artist Seth Globepainter in collaboration with Alexei Kislow, the 50-meter-high artwork was created to celebrate the French Spring Festival on Andriyivskyy Descent (an ancient street) at the conclusion of the Euromaidan protest. The girl in the painting is adorned with a crown of flowers and is wearing the military jacket used by protestors in the Independence square riots. The figure represents the new spirit of Ukraine; the child she is holding symbolizes the restored hope for the future. The portrait of Euromaidan activist Serhiy Nigoyan appeared near the famous Saint-Sophia Cathedral in the summer of 2015. Portuguese artist Alexandre Farto, also known as Vhils, depicted the Armenian-Ukrainian protester who was shot in 2014 during the Hrushevskoho Street riots. Nigoyan was the first activist who died in the anti-government demonstration and has, since then, become a symbol of the Ukranian revolution. 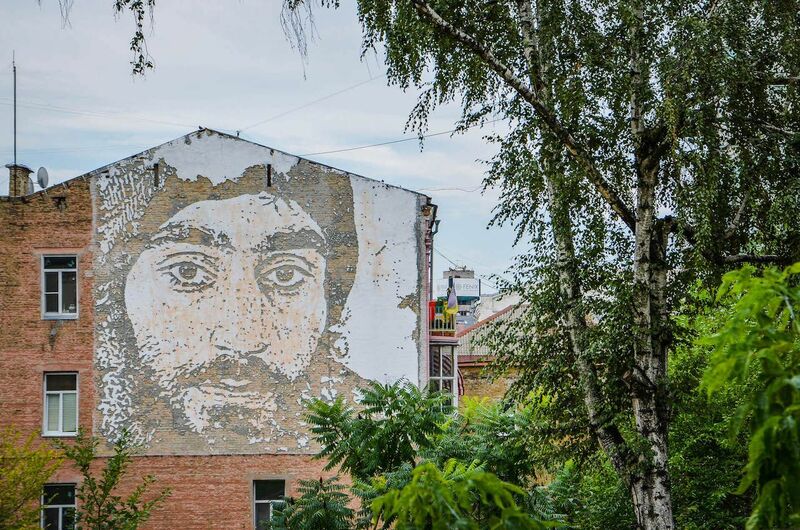 This piece of work is unique in Kiev not only for the subject portrayed but also for Vhils’ trademark technique: Rather than painting the face, the artist carved it directly on the wall of a building using exposed bricks and falling plaster. Of the many murals in Kiev, “Crows” by local artist Alexandr Britcev is one of the hardest to come across. Hidden inside an anonymous courtyard near the Golden Gate monument, you will find this brick wall covered entirely with dark blue crows surrounding a single white bird. The painting was completed at the end of 2015 and references the legendary aviary of Reitarskaya, where three crows named Cyril, Carlos, and Corbin are said to have been living for over 20 years. 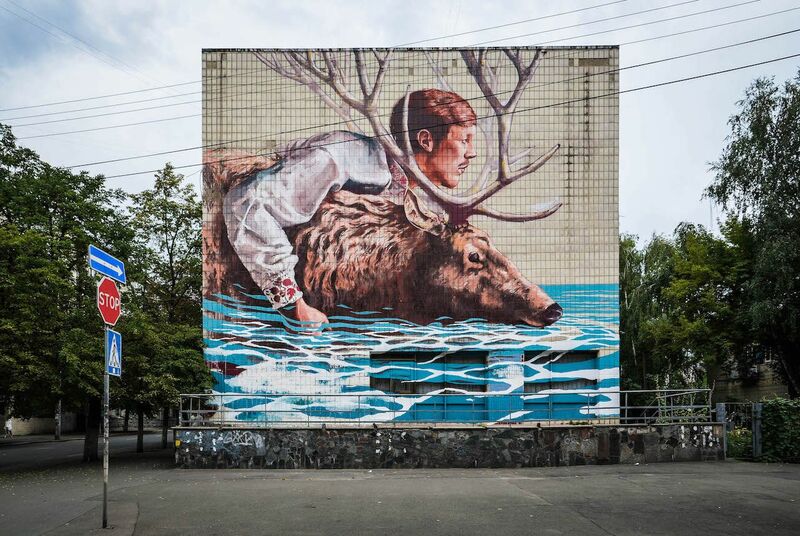 It’s at the intersection between Voloska and Khoryva streets in the hipster neighborhood of Podil that you’ll be able to admire Fintan Magee’s masterpiece, the painting of a huge deer helping a man to cross a river. The Australian artist volunteered to compose the image on the State Sanitary and Epidemiological Service of Ukraine to represent the period of transition the country was going through after the revolution and, at the same time, draw public attention on the current environmental issues.